Alpine guide Conrad Kain (1883–1934) was born near Vienna, Austria. When Conrad was nine his father died, leaving a large family in poverty. Kain left school at 14 and became a goatherd, later a quarryman, and in 1904, a mountain guide. He arrived in Banff in 1909, and started an assault on Canadian peaks which resulted in the first ascents of over sixty mountains. 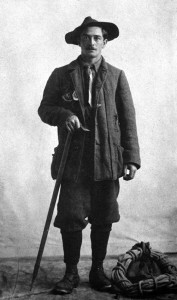 He accompanied Arthur Wheeler’s Yellowhead expedition in 1911, making the first ascents of Mount Resplendent, with Byron Harmon, and Whitehorn, solo. Kain spent that winter on the Smoky River, trapping with Donald Phillips. In 1913, Kain led William Foster and Albert MacCarthy up the north-east face of Mount Robson to the top of the highest peak in the Canadian Rockies. Kain married in 1917 and settled on a little farm in the Columbia valley, where he raised mink, marten and chinchilla, and continued mountaineering and guiding. In 1923, he accompanied an expedition to the Athabasca Pass and the Tonquin Valley, and the next year he was back at Mount Robson conducting climbing parties. J.M. Thorington wrote that “The people at Red Pass Station do not know the name of Mount Kain, but call it Needle Peak because of the enormous hole that pierces it just northeast of the summit.” Thorington, who edited Kain’s autobiography, Where the Clouds Go, made the first ascent of Kain Mountain in 1934.